In continuation of our endeavor to bring to you the best of literature on homeopathic philosophy, we are presenting Hahnemann's Organon of Medicine, Sixth Edition, with Robin Murphy's Commentary on Easy Homeopathic Practice. The book is illustrious in its own extent and is mostly discussing Hahnemann's 6th Edition, the last authority on Organon. 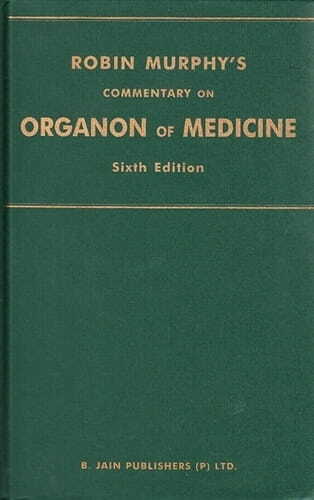 As Dr. Hahnemann himself wrote, "I have after 18 months at work finished the 6th edition of my Organon, the most nearly perfect of all." In this book Robin Murphy discusses the 6th edition in detail highlighting those points which were not included in the 5th edition or were misinterpreted in the 6th edition, with a very practical approach unique to his own, thus making case taking and prescribing easier. The author has taken great pains in explaining the 50 millesimal scale and its efficacy, a much needed work sought after by the homoeopaths for a very long time. Dr. Farrington wrote, "Hahnemann made many changes and some additions in his revision of the 5th edition of his Organon, the most important of which is what he terms his new and improved method..." - by Dr. Harvey Farrington (The Real Advantage of 50 millesimal Potency, Pg 15.) It is this new method (50 millesimal potency) and many more points and illustrations that the reader will be enthralled to go into and enrich himself with further knowledge of the subject.